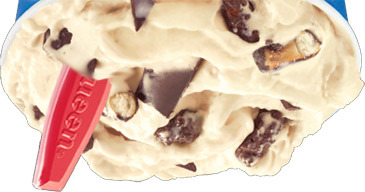 Man have I been drooling over the DQ Choco Covered Pretzel Blizzard for past week. Well, the terrible weather has gone away and it's another nice spring day which means DQ is packed! (despite it being free cone day at Ben & Jerry's). As I patiently wait in line for my glorious treat, I envision chubby hubby but in blizzard form. Oh the bar is being set so very high in my mind (never ever a good thing). As delivered : looks pretty good in the sun, doesn't it? I can't believe this, but I didn't like this one from the very first bite. There's something unsettling about the peanut butter. DQ says they were going for the perfect balance of salty and sweet, something you don't really see in blizzards, but this one comes across as way too potent. It's not a direct salty slam so much as it reminds me of a Reese's blizzard without the chocolate. Now that may sound dumb, but think about it. We've got that characteristically strong pb flavor that reminds us of a Reese blizzard, but there's nothing here to balance it out. "Dubba, that's what the pretzels are for!" you're shouting, but honestly, the pretzels just don't bring their A game this month. I adore Snyder's chocolate dipped pretzels, but that's not what you get here. DQ is using plenty of real pretzel chunks that are crunchy enough, but their coating has this strange gritty texture and mild flavoring. If you don't believe me, try treating one of the pretzel bits as a hard candy. The coating quickly dissolves off to a gritty coating on your tongue. It's not terrible, but it's misplaced and no match for the peanut butter. Oh sure, there are chocolate chunks too, and I don't have a problem with them, but they aren't bringing much flavor either. The aftertaste is the worst part. It's a lingering saltiness that's got me reaching for the water bottle. It pains me to say it, but this one isn't worth trying, at least not in this form. Maybe I got too much peanut butter (**update: yeah, most likely I got WAY TOO MUCH peanut butter), or maybe using chocolate soft serve for the base would help, but this one is a strike out when every part of me says it should have been a home run. 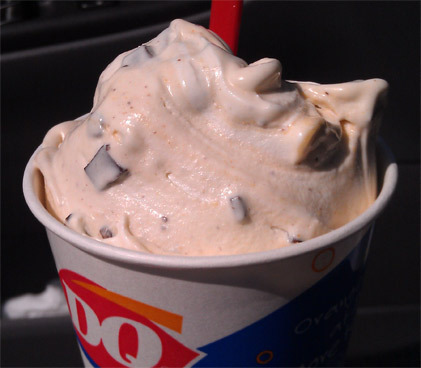 In DQ's defense, had this tasted like a Reese blizzard, I would have complained it was unoriginal. Just shows you how much the person making your Blizzard matters. I could barely taste the peanut butter in mine, actually I wasn't sure if it was in there. really? man I hate that about DQ. I practically spit mine out and you couldn't even taste it? That's just wrong in both cases. Just had the same thing yesterday, but mine looked much better than yours! Goes to show how much the individual preparation can effect the final product. After a decade of eating blizzards, I know this all too well (though that doesn't make my disappointment any easier). I saw your review and was surprised you felt the chocolate chips had the same make up as the chocolate coating on the pretzels, they struck me as vastly different. Tried it today & I loved it! I live in Kansas City, MO so maybe it's the individual at your local DQ. ATTENTION: Don't take someone else's advice when it comes to trying out dif types of foods and/or dessert because everyone's taste for something is completely dif than the next persons. if only i had said there was the distinct possibility they made it wrong (like DQ's are prone to do).... oh wait, I did! I had it with the chocolate ice cream and it was the best blizzard of my life.